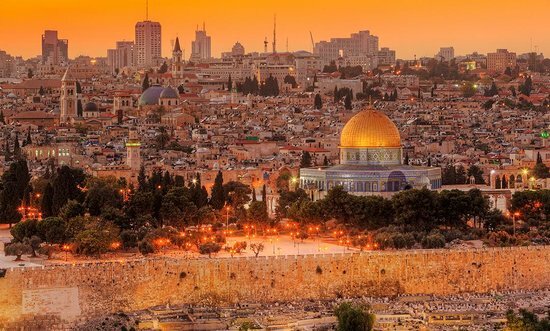 VIDEO: US Embassy to move the Jerusalem? First of all I hate this when news reporters do this; but at least here we have somewhat of a confirmation of facts. What I mean is, notice how the reporter states right off in the video that the issue at hand has to do with "moving the Capital to Jerusalem." They didn't show previous comments and they certainly never repeated that statement throughout the clip. And then we see the comments that follow are all about moving the American Embassy to Jerusalem. On my Daniel 11 defined page I show prophetic and historic confirmation that the Vatican has its sights set on Jerusalem. (See verse 45 on this) Satan has sought that land for eons so as to perfectly (so he thinks) mock the Lord Jesus Christ. And yes I can see this as part of his agenda regarding his long prophesied fictional appearance as Jesus Himself. This not only confirms those preaching the King of the North is Turkey are dead wrong on this and are purposely being used by the enemy of souls to confuse the masses into believing a lie over and above a prophetic fact known by God's people for over a century, it shows Rome is doing exactly as we expected when it comes to the land of Jerusalem. They already have all the people trusting their false agendas regarding the land of Israel so as to both lift up their false seven year tribulation and secret rapture lies that fit perfectly with their political plans. That way when it comes to fruition the people think the prophecy is actually fulfilled when in fact it was never prophesied. It was only an agenda of Rome that they worked towards that end. That also allows Satan to use the exact same lie he used 2000 years ago about 1000 years of peace. It worked so well back then with the Jews that it was an easy declaration by students of prophecy to predict its usage on the billions of lukewarm Christians in our day. I have more quotes to share but I don't want this blog entry to get too large. Plus, God willing, I plan to touch on this prophesied event in a little more detail in the next sermon I plan to share this coming Sabbath in our online church service. But can you see why Israel and Palestine have been fighting nonstop the last few decades? It's so the second beast under orders of the first beast in Rome can swoop in and act like the moral authority (with power) to stop the bickering and "save the day" for all concerned. The Pope in Rome has been prophesied to want that land and unless there was a way to take it legally without too much trouble, she would have to go to war. But doing so would tarnish their plans to keep a moral personage in the global arena so they can stand before all as the "moral authority" on earth. So like they did with Hitler back then and Islam today, they get others to do the dirty work for them. I also did a Newsletter on all this along with additional expected developments in January of 2006. Bottom line here is, Christian prophecy WILL be fulfilled. The Pope will soon plant his tabernacles between the seas in the glorious holy mountain and as Isaiah prophesied, Satan's 6000 year old desire to "sit also upon the mount of the congregation" (Isaiah 14:13) And once again, we see plainly the king of the North can in no way possible be Turkey. It was, still is and will continue to be the Vatican of the Roman Catholic church. On that we have God's prophetic Word. VIDEO: Catholics DEMAND blood! (graphic!) * VIDEO: British Muslims Gather in Show of Strength to Demand Caliphate * VIDEO: Russian Ambassador Assassinated in Turkey * VIDEO: Muslim congressman gets rare tough question on anti-Semitic past * Watch Sheriff Joe's report on Obama birth certificate investigation * Gov. John Kasich vetoes Heartbeat Bill, signs 20-week abortion ban * 13-year-old arrested after mass shooting threat reported at Tonkawa High School * Obama Administration Moves to Protect Planned Parenthood Funding * VIDEO: PhotoShopping AUDIO! This is not good! * VIDEO: US-made armored vehicles allegedly spotted at Hezbollah parade in Syria * VIDEO: Sheriff's probe finds Obama birth certificate 'fake' * Christmas Market Targeted With Nail Bomb by Boy, 12: German Officials * Hundreds of airline pilots are suicidal or thinking of self-harm, study finds * VIDEO: A 20-year toll: 368 gymnasts allege sexual exploitation * ANOTHER Roman Catholic nominated by Trump!